Philippe McGee @ Ph. D.
Philippe originates from Gatineau, Québec and has completed his B.Sc. in biopharmaceutical sciences at University of Ottawa while completing various internships at Boegringer Ingelheim and Natural Resources Canada. Philippe’s enthusiasm and passion for chemistry disseminates from his person and has given him many opportunities, amongst these the possibility of pursuing graduate studies in the laboratory of Prof. Louis Barriault. He is now finishing his Ph.D. in chemistry and has worked on the total synthesis of magellanine and the preparation of various vinyl gold species. Philippe’s trick to make reactions go… “you have to talk to them! ” Chemistry aside Phil likes snowboarding, extreme sports and rock climbing. Julie Brousseau @ Ph. D.
From Val-d’Or, Québec, Julie has completed her B.Sc. 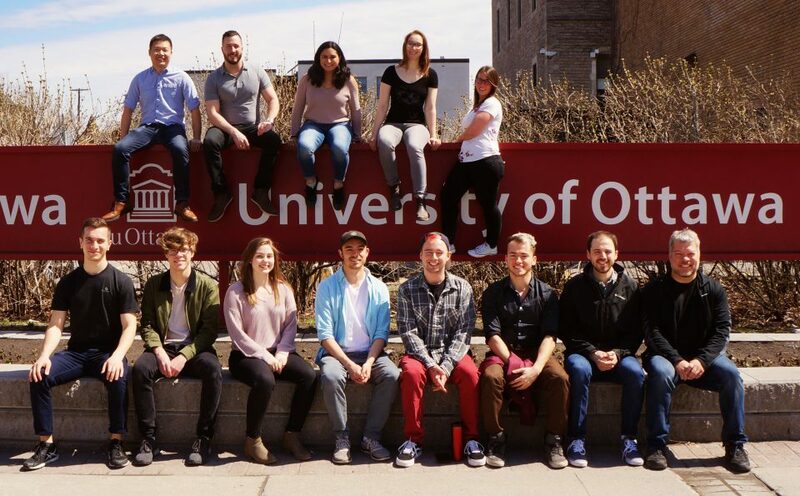 in Biopharmaceutical Sciences at the University of Ottawa, specializing in medicinal chemistry. She is currently doing a Ph.D. during which she works on the total synthesis of Morphine. When she’s not in the lab, Julie also enjoys playing with her cat, the outdoors, making cupcakes and talking about her cat. Martin Hébert @ Ph. D.
Originally from Moncton, NB, and recently completing his MSc. with Prof. Alexandre Gagnon (UQAM) on triarylbismuthines as cross-coupling reagents, Martin is now starting his Ph.D conducting research in natural product total synthesis. As an Ottawa native, Huy completed his BSc. in Biomedical Sciences – Medicinal Chemistry and is currently working on appplying Gold(I) lewis acid catalysis to natural product synthesis. Since first joining the group, he has worked on gold catalyzed photoredox chemistry, and has also previously completed internships at Theravance Biopharma and Cytokinetics in South San Francisco. When not in the lab, Huy ejoys eating all types of food then subsequently sleeping. Montserrat (aka. Montse) recently completed her B.Sc in Chemistry, and is now doing an Ph. D., working on organic methodology with gold photoredox catalysis. Originally from Mexico City, Mexico, in her spare time she enjoys making Mexican food, drinking coffee and teaching people about the proper toppings to put on a taco. Hailing from the distant port city of Halifax, Sam completed her BSc. in Biopharmaceutical Science, and is now doing her M.Sc. She is currently working on applications of photoredox chemistry in natural product synthesis. She has also previously done a research placement with Prof. Sheburn (ANU, Canberra), and worked in Health Canada. Outside the lab, Sam enjoys rolling D20 with labmates as a level 3 eladrin, and pumping Fe. Andre completed his BSc. in chemistry and is now doing his M.Sc. He is working the total synthesis of penestatin F. In his spare time he enjoys watching basketball, going to the gym, and life guarding. Formerly a home renovation expert, Alyson journeyed from the rural Quebec town of Chelsea to Ottawa to engage in the frontiers of organic synthesis research, specifically on the applications of Lewis acid gold(I) catalysis to natural product synthesis as a part of her M.Sc.. Outside of chemistry, she enjoys soccer and snowboarding. Avery is from Kenmore, ON, colloquially known to locals and surrounding villages as the town where cows roam free. He is currently doing his M.Sc. in photoredox chemistry. In his spare time, Avery is a hat enthusiast and likes to listen to Black Keys. Victor is an Ottawa native, completing his B. Sc. in Biopharmaceutical Sciences specializing in Medicinal Chemistry. He is currently working on his honour’s project in natural product total synthesis. When he is not in the lab, Victor can be found singing metal, snowboarding, performing piano, competing in Super Smash Bros. tournaments, and vibing to Despacito.